Milan, Italy — There’s something really strange about the Italian election, which is taking place this coming Sunday and Monday. The man who is considered the frontrunner in the election is a complete afterthought. On the other hand, the two men who are the outsider protest candidates are getting all of the attention. In conversations here in Milan, discussions about Beppe Grillo (the populist comedian that’s making bankers very nervous) outnumber discussions about any other candidate by at least 2-to-1. The next most talked about candidate is Silvio Berlusconi, who is trying to get back into power. He’s running a close (but consistent) 2nd place. If he has a poor showing, it could be the end of an era. The next most talked about candidate is Mario Monti, who was Prime Minister starting in late 2011, up until the beginning of this election. He’s widely disliked for being an unelected technocrat who raised taxes and instituted pension reforms. Most controversially, he passed a small property tax that hits anyone who owns a home (which is about 80% of Italians). Berlusconi has seized on that issue, promising to refund the entire tax, and he’s made it the centrepiece of his campaign (literally in his brochure, it’s his #1 promise). And then finally, the least talked about candidate is Pier Luigi Bersani, who is in the lead in the polls, and who leads the centre-left party. He seems to have no clear message or personality type other than being a competent guy, who the elites generally trust, except that he’s from the old school of Italian politics, and basically another same-old. He won a primary to lead his party, but many think that the other guy (who was younger) would have been a better candidate. Earlier today staffer on Berlusconi’s campaign wondered why it was that Bersani hasn’t many public trips to other countries, introducing himself. And he noted that, unusually, Bersani has a philosophy degree — not a background in business or economics, which is more standard. It’s not that unusual — especially in Europe — to see a battle between an establishment guy and a populist (like in the case with Greece last year), but usually the establishment guy is just, you know, standard establishment. Here in Italy, he seems almost absent. 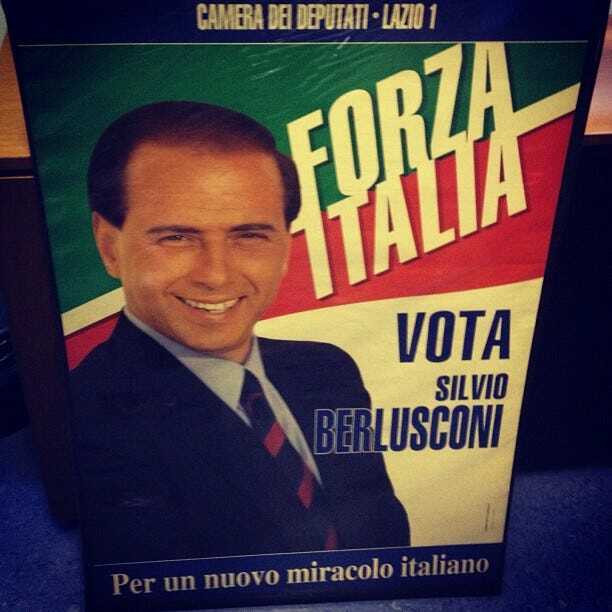 Meanwhile, here’s a poster we saw today at Berlusconi’s Milan HQ. It’s from his very first race in 1994. The bottom reads: For a new Italian miracle.